Featuring an open kitchen with center island, walk-in pantry, breakfast nook, formal dining area and large living area with a fireplace, this plan is ideal for entertaining or spending time with family. 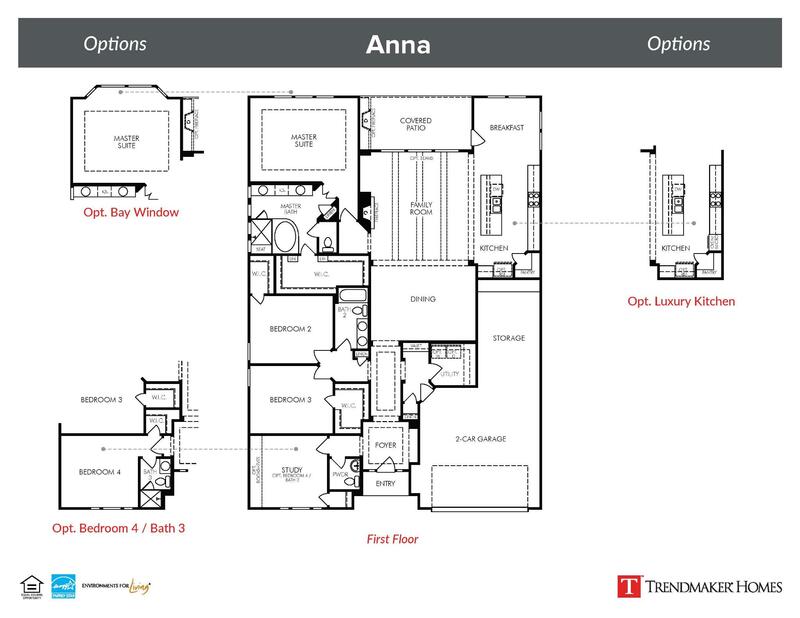 The private master suite comes with a large walk-in closet and master bath with corner shower and separate tub. Walk-in closets can be found throughout the house in additional bedrooms and private study room. This plan truly maximizes space with the addition of a separate utility room with valet area and additional garage storage. 2015 BUILDER OF THE YEAR1 AND 2014 DEVELOPER OF THE YEAR2. Trendmaker Homes, a member of the TRI Pointe Group. The prices of our homes, included features, plans, specifications, promotions/incentives, neighborhood build-out and available locations are subject to change without notice. Stated dimensions, square footage and acreage are approximate and should not be used as a representation of any home’s or homesite’s precise or actual size, location or orientation. There is no guarantee that any particular homesite or home will be available. No information or material herein is to be construed to be an offer or solicitation for sale. A Broker/Agent must register their client in person on client’s first visit at each community for a Broker/Agent to receive a commission or referral fee, if available. Not all features and options are available in all homes. Unless otherwise expressly stated, homes do not come with hardscape, landscape, or other decorator items. Any photographs or renderings used herein reflect artists’ conceptions and are for illustrative purposes only. Community maps, illustrations, plans and/or amenities reflect our current vision and are subject to change without notice. Maps not to scale. Photographs or renderings of people do not depict or indicate any preference regarding race, religion, gender, sexual orientation, disability, familial status, or national origin. Some amenities may not yet be constructed. Builder reserves the right to change the size, design, configuration and location of amenities not yet constructed and does not warrant the suitability thereof for any use or for any person. There is no guarantee that any particular homesite, home or common area will offer a view or that any particular view will be preserved. Views may also be altered by subsequent development, construction, and landscaping growth. A link to a third party website does not imply endorsement of that site nor any ability to control that site’s privacy practices. Marketing promotions/incentives, if any, are subject to conditions or restrictions and are subject to change without notice. No warranty or guarantee is made regarding any particular area public school/school district or that any particular public school/school district will service any given community. Schools/school districts may change over time. Builder does not warrant the suitability of any trail for any use or for any person. Our name and the logos contained herein are registered trademarks of TRI Pointe Group, Inc. and/or its subsidiaries. © 2019 Nathan Carlisle Homes, © 2019 Dunhill Homes, © 2019 Trendmaker Homes, Inc., a member of the TRI Pointe Group. All rights reserved.